Cortana voice and digital search assistant comes pre-installed with Windows 10. Cortana is among the best search assistant tools on any PC or mobile platform. You can enter voice or text commands to search local files, folders and items on PC as well we search information over the internet. Microsoft Edge is Microsoft’s new web browser that has replaced Internet Explorer on all new Windows copies. You can use both cortana and Microsoft Edge together to enhance your web browsing experience. Cortana comes built into Microsoft Edge and in here you will find out how to properly use Cortana on Edge browser when surfing the web. In this guide, we are going to show you how to use cortana with Microsoft edge on Windows 10. There is no doubt that Cortana has been a massive success, not many digital search assistants can rival Cortana in terms of fetching fast and accurate search results. Cortana for Windows 10 is based on Microsoft’s advanced voice recognition technology that understand every accent when user uses voice command for searching something. You can use Cortana to search files and folders, create reminders, change settings, see latest news and large array of other things. 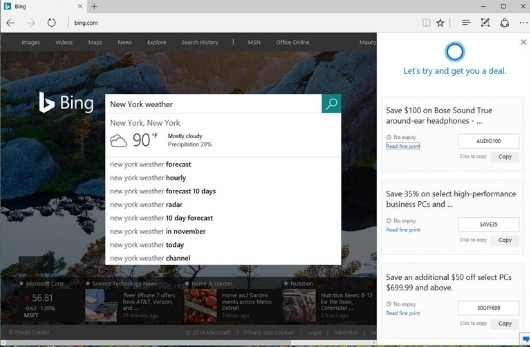 Microsoft also integrated Cortana inside Microsoft Edge. 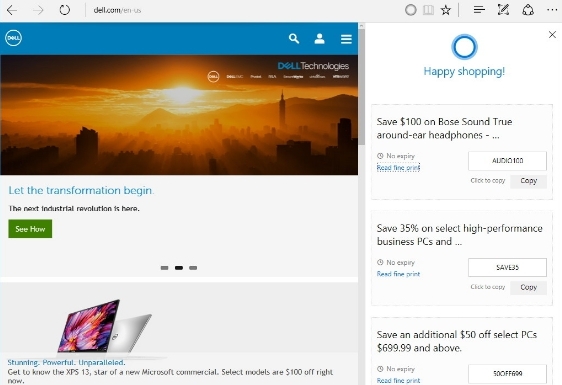 Cortana for Microsoft Edge helps users search items without needing to type anything, you can use just voice commands to find information and open websites on Edge browser by using Cortana. When you visit certain websites, Cortana pops up suggestions that help you to get things done quickly. Here is the guide that will walk you through various things that can be accomplished using Cortana on Microsoft Edge. Cortana on Microsoft Edge is integrated in such as way that it doesn’t interfere with your browsing experience. Even when it is enabled, it doesn’t show up unnecessarily ever now and then unless it is absolutely important that you can’t do without Cortana help. When Cortana’s intelligence system detects that it can help you improve your browser experience, it automatically jumps up just under the address bar where you can click on the address bar to start interacting with Cortana. Online Shopping: On popular online retailer websites such as Microsoft Store, eBay, Amazon, Best Buy, Staples and more, Cortana helps you to find better prices for the items you are looking for by offering discount coupons for items which can help you save money on your shopping. 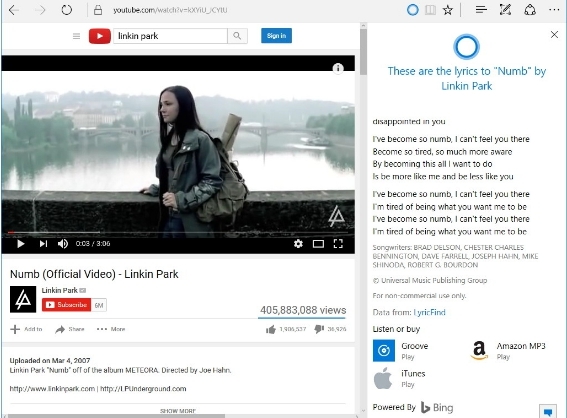 Watching Music Videos: When you are watching music videos on Microsoft Edge, Cortana can pull up a link to listen, suggestions to buy song from Groove, iTunes, Amazon or other online streaming service or can show the lyrics of the song while it is being played in the background on the Edge browser. Find Restaurants and other Places: Whether you are planning to dine out or making a plan to watch movies at affordable prices in theaters, just open the websitre and Cortana will bring up all the details about the location on the map, opening and closing timings, menu and much more. Download Apps: When you visit a certain website on Edge Browser and if it also has an app, Cortana brings up all the information about where you can download the app for that website and suggest better alternative apps for that website. You cannot force Cortana to appear in the address bar on Microsoft Edge. It only shows up when it thinks it can help to improve your browsing experience. It appears only when needed so that your browsing remain less intrusive. 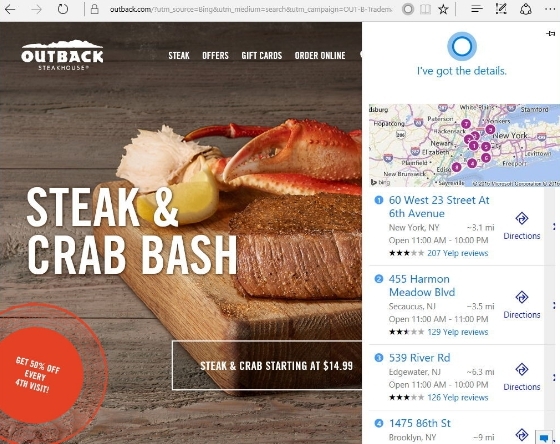 Cortana shows information about lets say restaurants, places or physical locations only when they are properly designed and marked on the map app and have helpful details available online. Cortana is a great tool to quickly find additional information related to the topic your are searching on the website. When you are visiting a web page, Cortana assists you to know more about any topic you are interested in. Highlight a word, phrase, image on any web page to get additional information on the Edge browser. When you ask Cortana about certain topic, it shows relevant information on the right side. For example, if you are asking about a particular place, Cortana will show a map, basic information about that place pulled out from Wikipedia, images, current weather and other related search results. Cortana uses Microsoft’s Bing search as default search engine, earlier you could change Cortana search engine from Bing to Google. Like on Google, you can go to Bing.com and type a search query, Cortana will provide the answer using Bing even before you hit the enter. This is called ‘instant answer’ feature that returns results that you would get using Cortana on any other web browser or desktop PC. Cortana on Microsoft Edge is actually an extension of the desktop version, it’s one and the same thing containing all your favorite Cortana features. You can manually enable or disable Cortana on the Edge browser. Here’s how to enable or disable Cortana on Microsoft Edge. Enable or disable the Have Cortana assist me in Microsoft Edge option by turning on or off the toggle switch. Cortana for Microsoft Edge is not available everywhere. It’s because Maps and some regional information is hard to find on the internet. Only a limited number of regions get this Cortana on Edge browser facility. In some regions where Cortana is available, it may not provide all information that you need because of the poorly designed maps or lack of reliable information about the place. Like Coupon Discount offer is only available in the US, while maps feature may be less than accurate in some countries.